KitLock is a stylish alternative to traditional key cam locks that uses a code rather than a key to secure lockers in gyms, leisure centres, sports and fitness clubs. Earlier in the year we conducted a market research survey, where we discovered that 70% of the leisure centres, sports and fitness clubs that took part, still used keys to secure the lockers in their changing rooms. Key management can be a concern for managers due to the number of keys that get lost or accidently taken home. Using KitLock, clients can simply enter a four-digit code, lock and go; free to enjoy their fitness session without having to carry a key around with them or having to use coins or tokens. Many gyms, leisure centres, sports and fitness clubs now have contemporary-looking changing rooms. Almost a third of the respondents to our survey had upgraded their lockers with new locks. Half of those cited the need to modernise the look of their changing rooms as the most popular reason. Saving time and money replacing keys was a close second. How does a KitLock operate on a locker? A KitLock is very easy for clients to use. The lever handle on an available locker will be in the open position (A). The client opens the locker door, places items inside the locker and closes the door. The lever is turned to the closed position (B) and the client enters a four-digit PIN code. A beep is audible for every button pressed. The blue LED will flash after the last digit; the new code is now accepted. When the locker is locked a red light will flash on the KitLock. To re-open the locker, the client enters the four-digit code and turns the lever to the open position. 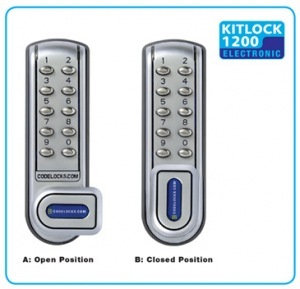 KitLock is available to order in any standard RAL colour. For more information visit our website or call 0800 393405.